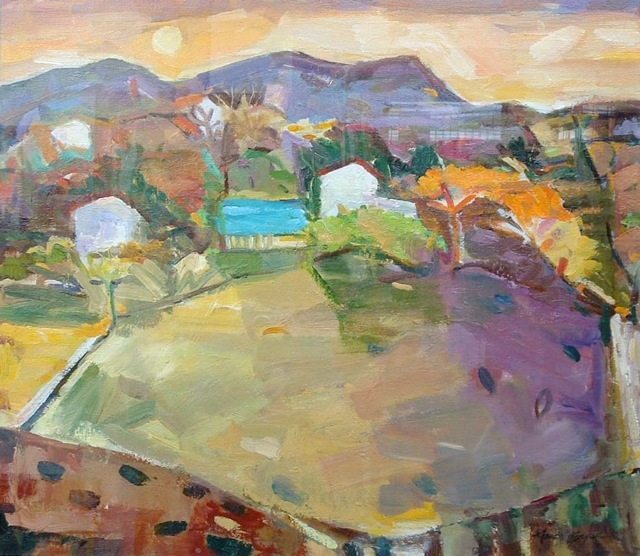 Every time she paints, Annette Edgar sees the world anew with a searing use of colour and true approach to mark-making. Because I like to use saturated colour I find myself drawn to sunny places. Currently my three favourites are Tuscany, rural Spain and Los Angeles. During the past few years I have been visiting northern Tuscany where friends of mine live inland and on the coast. The hills there have a wonderful translucent light with layers of colour as trees and plants pattern the slopes. On the Italian Riviera I particularly love the long shadows at the end of the day or even better at the end of season when there is a haunting surreal quality. Rural Spain especially northern Majorca is where I go to find the haphazard, whether it be buildings, plants or boats. Its slow pace of life feeds my soul.